The Raygun Gothic Rocketship is the new art piece by Sean Orlando, Nathaniel Taylor, David Shulman, which is the same crew that gave life to the Steampunk Treehouse. The Raygun Gothic Rocketship is an immersive rocket base environment consisting of a tall metal rocket connected via walkway to a taller gantry with a well-defined lighted perimeter. Participants can interactively explore the rocket’s three interior chambers accessible through the bottom of the rocket and the top of the rocket via the gantry. Aesthetically the project will be done in a rococo retro-futurist vernacular between yesterday’s tomorrow and the future that never was, a critical kitsch somewhere between The Moons of Mongo & Manga Nouveau. Art, however, does not exactly grow on trees. 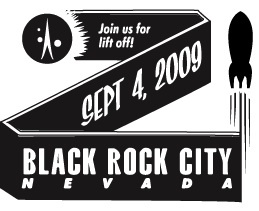 That means it’s time for The Galatic Gala, a Big Ol’ Party/Fundraiser to help bring the rocketship out to Burning Man 2009 to launch at Black Rock City. The event takes place Friday, June 5th at the elegant Bently Reserve, featuring performances by Bad Unkl Sista, Zoe Keating, Fou Fou Ha!, Mark Growden Trio, Tara Quinn, and the Copper Lantern Fire Theater. Costumes are encouraged, as they should be. Advance tickets are now on sale. Of course, the only thing better than aiding and abetting art like this is to actually make it. Luckily, the Raygun Gothic Rocketship folks are searching for people to chip in (i’m looking your way NASA). You can sign up on Facebook or Twitter if interested.